The ultimate Porsche-designed Mercedes-Benz, the 'S' or 'W-06' class cars were powered by a supercharged, in-line six cylinder engine with overhead camshaft, two updraft carburetors, and dual ignition. Approximately 372 of these Sport models were produced between 1927 and 1934. Forty-two of them were SSKs (for Super Sport Kurz or Short), short chassis two-seaters which could reach 115 MPH with the Sindelfingen factory body. The first vehicle specifically created to be driven on the road and on the racetrack, it proved to be remarkably successful at such venues as LeMans, Monaco, and the Mille Miglia. The factory racing program was over when this chassis was completed in 1930, leaving some components available for installation on the last of the road cars. Engine 77644 was built with the higher compression pistons and the renowned 'elephant blower', or supercharger. The factory commission papers show that chassis 36038 was shipped to Tokyo as a chassis only in February 1930, where it was unable to attract a buyer and returned to the factory. In October it was delivered to the Mercedes-Benz sales agent in Milan, Carlo Saporiti. When we completed this restoration in 1993, the information we had at the time indicated that Sr. Saporiti had sold the SSK directly to Count Carlo Felice Trossi. Further research by Historica Selecta, compiled in 2009, has revealed that the chassis was first sold to Sr. Antonio Maino. He had a spyder two-seater body built for the chassis at Carrozzeria Touring. From December 1930 to 1933, chassis 36038 was raced at various venues, from the Mille Miglia to hillclimbs, and newly uncovered ACI PRA (Automobile Club d'Italia del Pubblico Registro Automobilistico) documents show that ownership changed multiple times. When Count Trossi purchased it in June 1933, he had his own body built for it. During our research for the restoration the Trossi family archives yielded two renderings: one from an unknown, independent coachbuilder, and the Count's personal sketches of an open roadster without top, the 'Count Trossi' SSK. The magnificent car you see here could not have been authentically restored without the generous enthusiasm of prior owners and other collectors. For example, the dashboard layout is unlike any other SSK. Thanks to historical documents saved by Count Trossi's daughter and grandchildren, we are able to see the layout of the dash in a photo taken in front of their family home. We also have early photographs kindly supplied by Miss Mary Schaub, daughter of the man who owned it from 1954 to 1963. 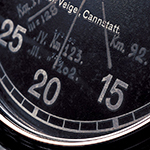 From these sources and others, we were able to verify that the hand painted reference marks on the tachometer have been there since before the 1950s. Chasing leads and digging for information is one of the most important and least acknowledged aspects of any restoration project. Upon disassembly of the engine we noted that many of the parts had been numbered RB 1420-14 (an internal work order number) by the factory. However, the number stamped on the oil pan was not a match. With the help of noted German collector Fritz Grashei, we conducted an extensive search through many private collections and found the original oil pan. Ultimately we negotiated an exchange in order to return the correct oil pans to both this SSK and to the engine in Germany. We accomplished this challenging restoration in collaboration with the current owner and his vision for this dramatic road-going sports car. This joint effort was rewarded with Best of Show at the 1993 Pebble Beach Concours d'Elegance and at the 1995 Meadow Brook Hall Concours d'Elegance. The Count Trossi SSK has since been honored by its inclusion in the 'Moving Beauty' exhibit at the Montreal Museum of Fine Arts in 1995, the 'Speed, Style & Beauty' exhibit at the Boston Museum of Arts in 2005, and the 'Art of the Automobile' exhibit at the Musée des Arts Décoratifs in 2011.